Mahabodhi Metta Charitable Fund was established in 2004 with the intent to promote and support the charitable humanitarian projects of the Theravada Buddhist Maha Bodhi Society and Mahabodhi International Meditation Centre in India. These two organizations are well established charitable organizations recognized by the Indian government. Since 1956 their compassionate timely acts of service and community-based programs have benefited thousands of needy people. The selected focus of our U.S. organization is the education of underprivileged children and women, care of the destitute elderly, and the provision of medical services at the hospitals and through medical camps. To date, our Board members have covered all the costs of our U.S. operations. We are pleased to announce that this will be ongoing. Therefore 100% of all other donations we receive will be sent on intact to fund the designated project that the donor has selected. 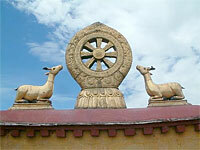 Mahabodhi Metta Charitable Fund is a recognized 501( c) 3. Donations are tax deductible to the fullest extent of the law.